Have you got an untimely guest who have come without intimation. You are thinking what you can treat them with that can be prepared in less time? Here is the solution for that. This snack item is really a nice one and quick to prepare. I’ve tried it at home and it came out really well. 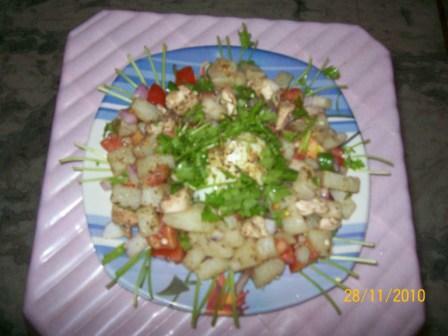 Take boiled potato and the chicken pieces along with tomato and onions. Add the chopped green chili and all the powder masala along with salt and lemon juice. Mix it well and thoroughly and keep in fridge for sometime. Take it out, sprinkle some chopped coriander leaves and serve it. You can keep a boiled egg in the middle, for garnishing.